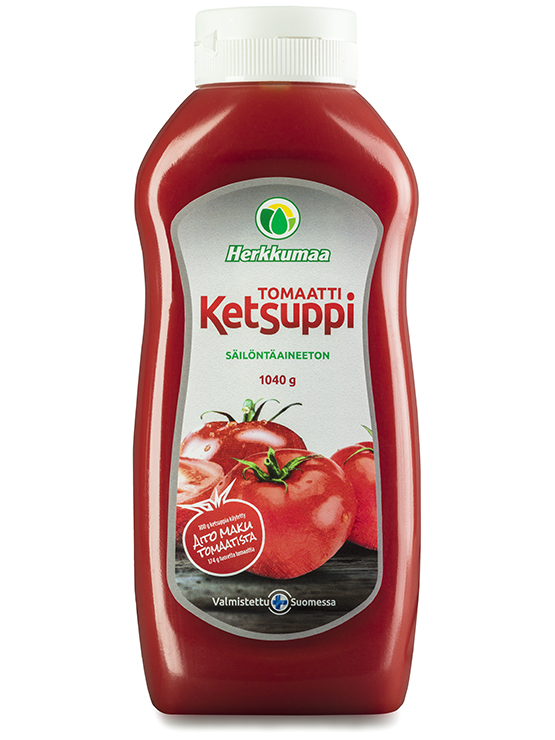 Herkkumaa’s preservative-free tomato ketchup gets its flavour from an abundant amount of tomato: as much as 174 grams of fresh tomatoes have been used per 100 grams of ketchup. Since we only use tomatoes of the highest quality, we do not cover the taste of real tomato with unnecessary seasoning, such as peppers or extracts. For the best ketchup in Finland, we only use the traditional ketchup flavorings of vinegar, sugar, and salt. Ingredients Tomato mash (71 %), sugar, wine vinegar, modified corn starch, salt, thickener (xanthan gum).